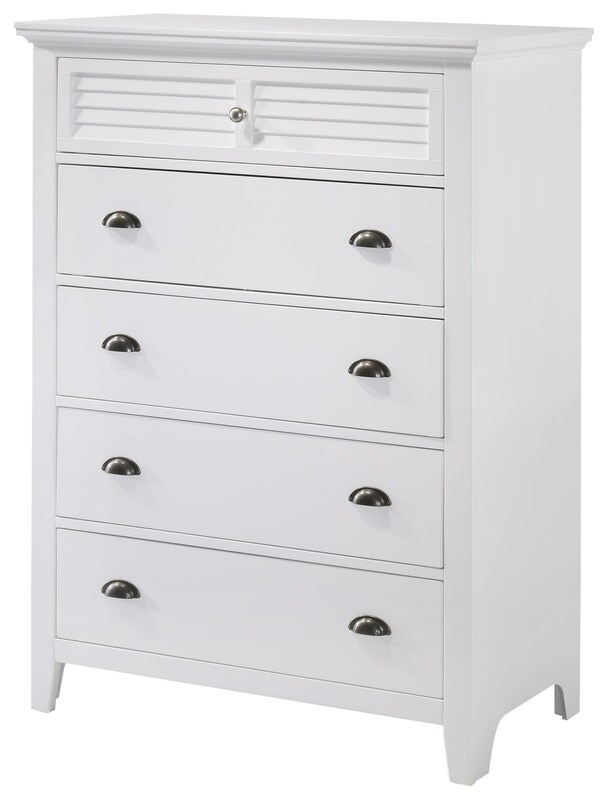 The C7313WHITE Chest by Lifestyle at Furniture Fair - North Carolina in the Jacksonville, Greenville, Goldsboro, New Bern, Rocky Mount, Wilmington NC area. Product availability may vary. Contact us for the most current availability on this product. This transitional bedroom group by Lifestyles International features clean crisp lines and silver hardware with louvered panels in all pieces to give it an updated modern look. It will add style and a design element to any bedroom! Available in White or Gray finish. The C7313WHITE collection is a great option if you are looking for furniture in the Jacksonville, Greenville, Goldsboro, New Bern, Rocky Mount, Wilmington NC area. Browse other items in the C7313WHITE collection from Furniture Fair - North Carolina in the Jacksonville, Greenville, Goldsboro, New Bern, Rocky Mount, Wilmington NC area.